﻿Welcome back to week one of the Great Canadian Quilt Off, eh! On Monday Amanda wrote about choosing fabric and how she plans to make some simple changes to the quilt top in order to increase the finished size. While she's busy working away on her version, I'm kicking off my own smitten quilt this week, starting with three Cuzco charm packs that I picked up last month from Bloomerie Fabrics. I love the range of colours in this line, but more than anything I love the prominent colour gradients. What first caught my eye about Rachel's Smitten pattern is how beautifully her stars are divided into colour themes. When planning out my quilt, I wanted to ensure that my stars stood out against the white negative space of this quilt top, like Rachel's do, but I also wanted to do something a little bit different. Because Cuzco has such a wide colour gradient, I thought it would be fun to play on that theme. After I prepared all of my blocks, I began by laying out the stars by colour and gradient, placing the darkest hue in the top left corner, and the lightest in the bottom right. Since I will end up with two identical stars, I thought it would be interesting to show you a comparison of before and after sewing one of the blocks together. I'm thrilled with how these blocks are shaping up and can't wait to show you more next week. Be sure to swing by then to see how both of our quilts are progressing. Happy quilting! Oh Cuzco! So bright and beautiful - and I love what you're doing with it. Great block! I need to have a closer look at this! Love the fabric choices. It is a great block. oh my the cuzco is looking fantastic!! 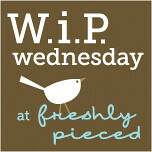 Thanks for linking up to w.i.p. Wednesday, where I'm having the pleasure of guest-hosting! Ooohhh... love what you're doing with those Cuzco charm packs! Can't wait to see the finished quilt!